Yet another transformer preamp, I know, I know. I apologise, but they do happen to be one of my favourite types of audio gear, and this one looked so special, I just had to try it. Actually, it not only looks great, but it’s also a fully balanced design which is something that I haven't experienced before. All transformer preamps I have tried until now had a single transformer for each channel. You could call them single ended for that reason, but in the world of transformer volume controls things are not that simple. That's because a transformer is capable of converting a balanced signal into single ended and the other way around. In pro audio they are used precisely for this purpose all the time, so saying that a transformer is either single ended or balanced is basically wrong: they can be both. That's not to say that any transformer will always be able to handle both single ended and balanced signals. For proper balanced signal handling the transformer will need a centre tap, making sure that both sides of the output are fully identical relative to ground. But, actually most balanced power amps aren't that picky and will happily accept a 'pseudo balanced' output from a transformer without centre tap. On the input side things are even simpler: a centre tap is rarely necessary there. My trusty Django, which uses a pair of the famous S&B TX102 transformers, has a full complement of both single ended and balanced inputs as well as outputs. 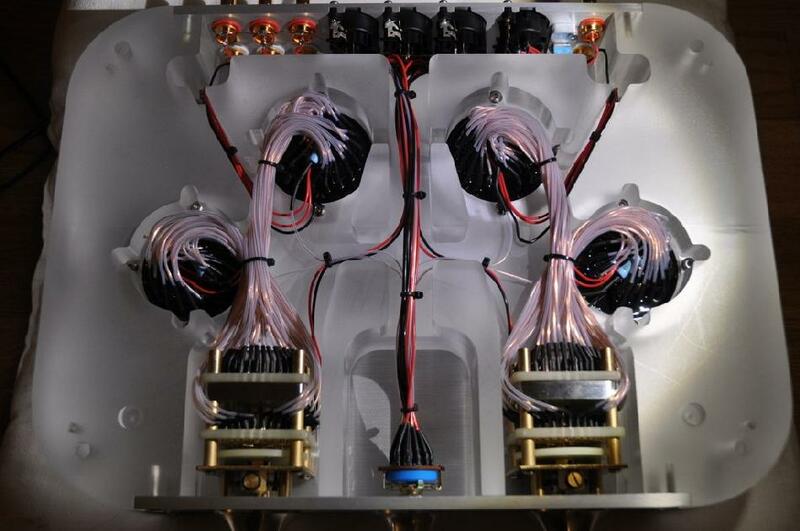 It will mix and match between these without problems, and the only thing to remember is a little switch at the back to select the appropriate output mode, which will only change the grounding. But, obviously, the Django only has a single set of transformers and the balanced connections lack the centre tap. This has never been a problem for me, and I have used the Django for over 7 years now with all sorts of sources, power amps and active loudspeakers. It always worked fine, single ended as well as balanced. Then I discovered the Audio Music R-S. It doesn't use a single transformer per channel, it uses two. This preamp really is fully balanced, with a separate TVC (transformer volume control) per side of the balanced signal. That’s balanced volume control done properly, a fact that is proudly shown on the top of the R-S, where 4 transformers stick out of the housing. This separate handling of both sides of the signal prevents them being summed and then split again, although one could argue that this can be done in a transformer without any penalties anyway. What it does mean is more headroom, I assume, as the load is now split between two transformers. Obviously, using double TVCs also means using a double set of switches for both input selection and volume control. All of this makes the wiring inside quite complex, and perhaps for that reason it has separate volume knobs for left and right. The only other controls, beside input selection, are two small switches at the top towards the back. They allow you to increase gain by 6dB. My Django also has a similar gain switch, which I have to admit I have never used. Actually, I've almost never had the volume beyond half way up, so I suspect that the additional 6dB isn't necessary in most cases. One thing the Django has is a switch to lift the ground, essentially breaking any direct electrical connection between input and output. This can break ground loops, and is one of the unique features of transformer preamps. Except that the R-S does not have one. The documentation online mentions the fact that ground loops will be broken as one of the big advantages of transformer preamps, but when I checked I found that ground is simply connected from all inputs to all outputs in the R-S, without any option to break this connection. I didn’t have any trouble during the review period, but still think this is a bit of a missed opportunity. Just like the Django, the AMR-S features single ended as well as balanced inputs and outputs. But when using balanced input with a single ended output, only a single pin of the balanced signal is used: the single ended output is simply taken from the transformer connected to the hot pin of the XLR input. Of course this will work just fine, and even sound OK, but it certainly is not a proper conversion in the real sense of the word. The same could be done with a simple lead that only connects RCA to the hot pin. Although this will serve fine for secondary sources, if your main source is balanced I suppose that you'd like to use the full signal from that source, and not just half of it. The situation gets worse when using single ended input with balanced outputs. Again, only the hot pin of the output XLR connectors is now being driven. This is not a safe way to drive a balanced amplifier, so AM does not recommend this configuration. That still means there's a certain risk involved with the fully balanced setup: if you have single ended secondary sources, like a TV or an MP3 player, it would be tempting to also connect them to your main system through one of the RCA connectors. It is difficult to say what would happen: some power amps will work without any problems like that, but others might cause trouble. I don't think it's a very good idea, to be honest, and I didn't even try it out. I wouldn't recommend it either. All this leaves the number of possible configurations rather limited in my opinion. Using this preamp with a single ended power amp is a bit wasteful, as you are now effectively only using half the preamp, even with balanced inputs. Using it with a balanced power amp, or balanced active speakers, makes use of all transformers, but now you are limited to fully balanced sources only and have to remember to never use a single ended source. Personally I think it would have been much better to simply limit the input and output options to balanced only, and market this preamp as such. Build quality is truly exemplary. Very, very impressive. 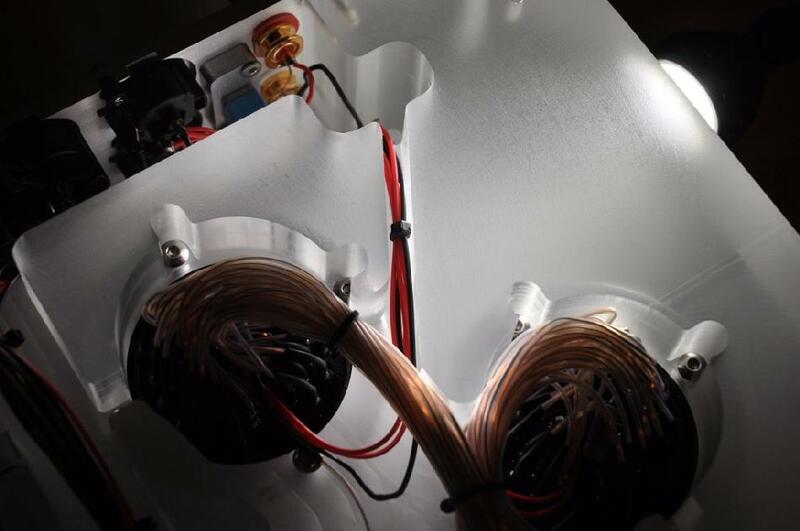 The TVCs are wound by AM themselves, and the whole preamp is made from a single block of acrylic, with spaces for the transformers, switches and wiring routed out. The top and bottom are made out of thick sheets of stainless steel. The result is amazing, with a solidity that I haven’t experienced before. There’s absolutely no ringing or even any movement possible. 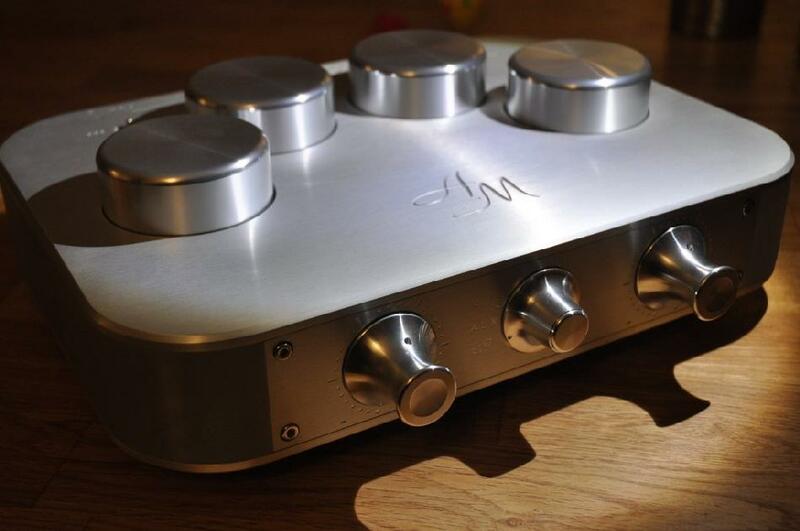 The preamp sits on three stainless steel conical feet, again absolutely stabile. The whole look and feel of this preamp is completely unique and it really deserves to be shown off at the top shelf of your rack. There's one additional control at the back, which I only noticed at the end when I was taking the photos. It is a potentiometer, but without a knob attached, so I assumed it was set in the factory and not meant to be fiddled with by the user. But then, when I returned the preamp to Iain Borthwick, who imports them for the UK, he told me this was a control to set the output impedance. As far as I know this should simply be as low as possible and you do not need a control for that, but Iain demonstrated the effect to me in his rather nice demo system. The effect was clearly audible, but the best sounding setting was with the control all the way down, so basically out of circuit. My final point concerns the double mono volume control. I didn't think it would matter to me, but to my surprise it did, and I found it to be slightly annoying. It means you always have to count the clicks, or else have a very good look at the knob to see what volume is indicated. I'd rather have a single volume control, but I suppose this way you also get a balance control, which is an undeniable advantage. Some people might also find the lack of remote control a problem, but I personally don't care about that, certainly not with a preamp that has such a nice, solid feel to its controls. I started using the AM S-R with my OPPO 105 universal player and my Unity Audio 'The Rock hifi' active speakers. Both of these feature balanced connections, so I could benefit from the fully balanced design of this preamp. The sound was an instant success: solid, sweet, powerful, clean and natural, just what you would expect from a good TVC preamp. Especially the bass was impressive, with excellent depth and power. Used like this, I have to admit this preamp is serious competition for the Django with better bass and equal sound quality for the rest of the spectrum. 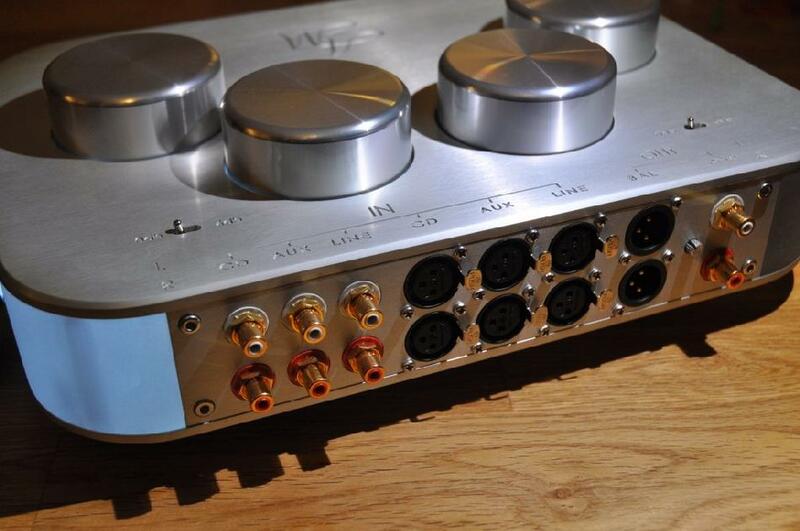 That makes it a seriously good preamp, one of the best I know. The solidity of the sound is the defining characteristic of the R-S. Top quality TVC or AVC (autotransformer volume control) preamps tend to be very good at this, much better than resistive passive preamps, but the best active preamps can still beat a transformer preamp on bass performance and drive. Not the AMR-S I think, and if there's an active pre out there that is seriously better, then I'd like to try it. Most telling is that the bass performance of the OPPO when connected directly to my active speakers is not better than when used with the AMR-S, which is very impressive indeed. The direct connection still wins in terms of impact and dynamic expression in the mids and upper range, but even there the difference is small. Used single ended the difference with the Django becomes smaller, to the extend that it is difficult to decide which one is better. When using the R-S with the balanced outputs of the OPPO and the single ended inputs of the Rock loudspeakers, the sound lost some of its weight and impact compared to the balanced outputs, but the difference wasn't very big. It is a perfectly fine sound, but the knowledge that you are only using half of the balanced output of your source, and only half of your preamp makes me a bit uncomfortable, but for secondary sources this would be perfectly fine. Thing is, a single TVC preamp would work just as well in those circumstances, or perhaps even better as it will utilise both sides of the balanced input. This is a completely balanced design, and although it can be used in other ways I don't think that makes much sense. Only when all your sources as well as your power amp are balanced will you get the benefit from the double TVC design of the Audio Music R-S. Using it in single ended mode is simply only using half of it. Having said that: if you can use it fully balanced then you will find yourself with one of the best sounding preamps available. Add to that the exquisite build quality and spectacular design and you're looking at a great deal with the R-S. If your system is not fully balanced, however, there are more affordable single TVC preamps available.